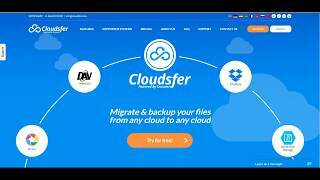 Cloudsfer is a cloud based migration service, supporting over 20 cloud storage providers such as Autodesk® BIM 360®, Google, Dropbox, Box, SharePoint, Office 365, Aliyun, Azure, Amazon S3, Amazon Cloud Drive and many more. Migrate and transfer your data from/to BIM 360. Cloudsfer is designed to seamlessly migrate data, requires no installation, no hardware, and no bandwidth during the migration process. Companies and users can migrate their data in a fast and secure manner while continuing to work on their source systems. In order to start the free trial, please sign up to Cloudsfer and contact our support team, who will enable BIM 360 for you. Cloud Service - Let us handle the migration for you! Transfer your data quickly with our fully hosted SaaS environment. Recurring Delta Migration - Transfer your newest data into the target storage system at the press of a button. Schedule a recurring daily, weekly, or monthly migration according to your needs. Analyze your data and monitor/download reports regarding every step of the migration process. Hi Oscar, BIM 360 can be used for a free evaluation. If you require more than that, the service does require payment according to the amount of data needed for the migration. Please contact our support team (support@cloudsfer.com) for more information. Hi Oscar, BIM 360 can be used for a free evaluation.&#13;&#10;If you require more than that, the service does require payment according to the amount of data needed for the migration. Please contact our support team (support@cloudsfer.com) for more information. Not available for Bim360 EU? We miss the cloudsfer app in our new BIM360 EU datacenter. Any recommendations on how to migrate project data (7GB, 7.000 files, 3.500 folder) to a new project? Hi Bernd, Cloudsfer does integrate with BIM360 EU accounts. If you have the apps enabled in your project admin and cannot find the app, please contact Autodesk and verify if this can be enabled. We can also try to enable this via custom integration, please contact our support team (support@cloudsfer.com) for more information. Hi Bernd, &#13;&#10;Cloudsfer does integrate with BIM360 EU accounts. If you have the apps enabled in your project admin and cannot find the app, please contact Autodesk and verify if this can be enabled.&#13;&#10;&#13;&#10;We can also try to enable this via custom integration, please contact our support team (support@cloudsfer.com) for more information.